California Gov. Gavin Newsom will allow state fire officials to bypass some environmental regulations to clear dead trees and other vegetation ahead of the next wildfire season. Robert Handa reports. California Gov. Gavin Newsom will allow state fire officials to bypass some environmental regulations to clear dead trees and other vegetation ahead of the next wildfire season. His order went into effect Friday as he declared a state of emergency, saying the number of dead trees across the state is “creating extremely dangerous fire risk.” California experienced two of its most destructive and deadly wildfire seasons in 2017 and 2018 and experts say climate change is increasing the risks. “The increasing wildfire risks we face as a state mean we simply can’t wait until a fire starts in order to start deploying emergency resources,” Newsom plans to say, according to excerpts released by his office. But some environmental groups say Newsom, a Democrat, is taking the wrong approach by waiving environmental rules designed to protect California’s water, wildlife and people. Clearing trees, for example, could hurt the stability of soil and lead to more natural disasters, said Kathryn Phillips, director of the Sierra Club California. Newsom’s order will cover 35 projects across nearly 141 square miles (365 square kilometers) of land identified by the California Department of Forestry and Fire Protection as critical to guard against fire threats. The projects are targeted at disadvantaged communities, such as those with high poverty levels and language barriers. They include work around the city of Redding and in Butte County, the sites of major 2018 wildfires. 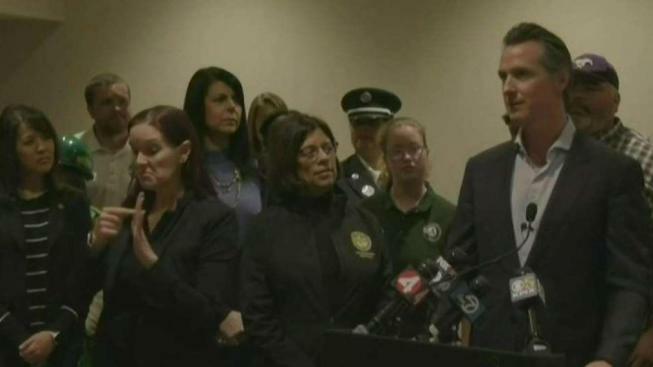 Newsom has directed National Guard troops to help. The order suspends state rules and regulations for the rest of the calendar year that fall under the California Environmental Protection Agency and the California Natural Resources Agency. That would include requirements under the California Environmental Quality Act, the backbone of the state’s environmental law. Fire officials would need to get approval from either state agency before moving ahead on the project. It also allows people with timber operator and tree service contractor licenses to do additional work. Beyond waiving regulations, Newsom is spending $50 million on public outreach efforts around disaster preparedness and response. He’s also issued a request for innovative proposals from the private sector to deal with wildfires.